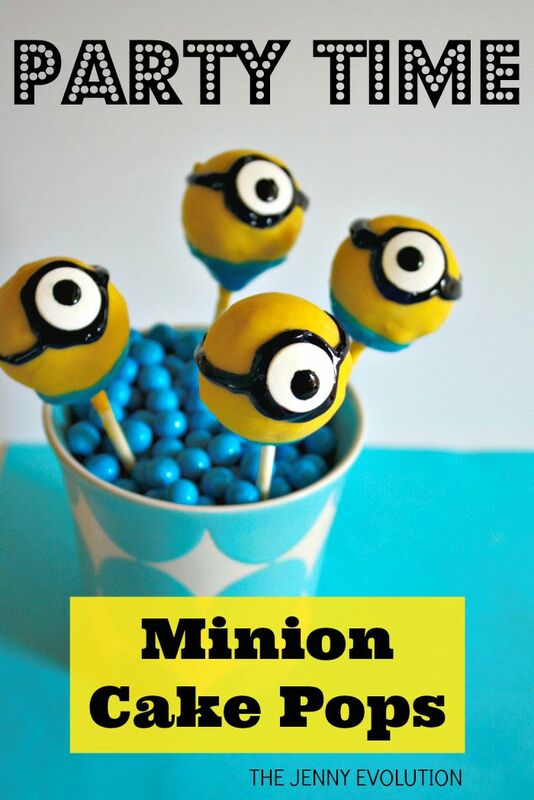 Minion Cake Pop Recipe – Birthday Party Fun on a Stick! 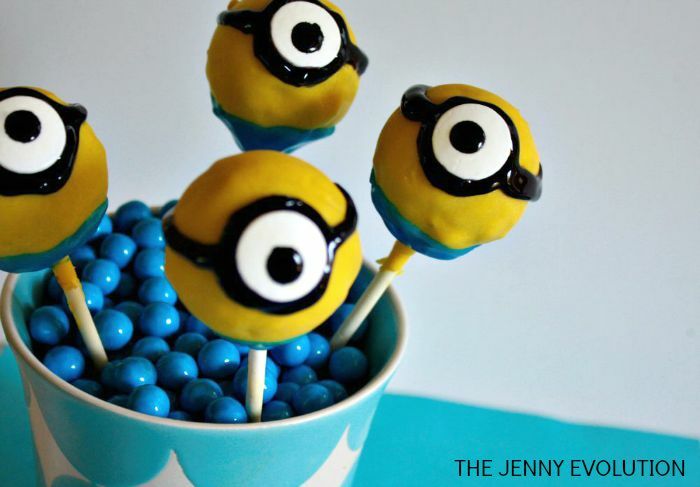 Our Minion craze continues in the house with this adorable Minion Cake Pop Recipe! My kids are going to flip out over these. 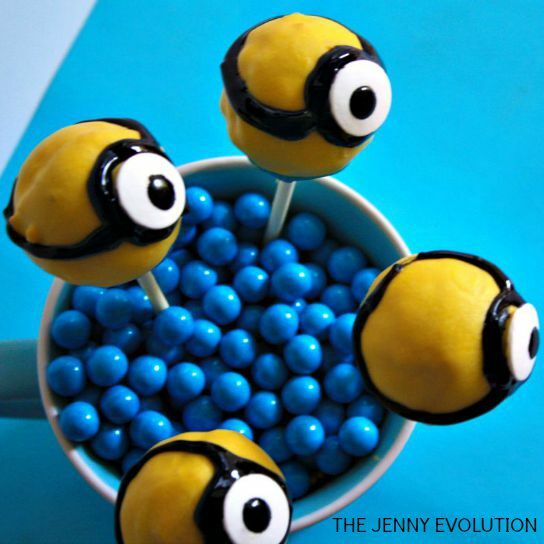 These Minion Cake Pops would be perfect for a minion birthday party or for a special and fun treat. They’re just the right size for a serving and who could resist these scrumptious yellow guys! Using the back of a large spoon, mix cake crumbs with about ⅔ of the can of frosting. You won’t need the rest. Re-shape balls into smooth cylinders for Minion shapes. Use wax paper to help make the shapes. Place shaped balls in the freezer for around 15 minutes to firm up. Then transfer them to the refrigerator to keep chilled and avoid freezing. Melt yellow candy coating in a heat-proof plastic bowl so that the coating is about three inches deep for easier dipping. Melt in the microwave in 30 second intervals on low, and stir in between. Repeat until melted and smooth. Dip the tip of a lollipop stick into the melted coating and insert into the cake ball. Dip in yellow coating and remove in one motion without stirring the pop. Note: If your coating is too thick, you can add a little coconut oil to make it easier to work with. Gently tap and twirl off excess. For the googles use a black gel frosting and draw them on. A licorice rope will also work. Using the Blue Frosting gently squeeze onto your minion while twisting. Set in the refrigerator for 20 minutes to set. 1. If using a cake ball pan skip the frosting. There is no need to crumble and add it in. Instead heavily oil your cake pop pan with coconut oil and flour before adding in the cake mix. Also let the pan cool completely (stick it in the freezer for 15 minutes) before trying to separate the containers to pull the cake pops out. 2. If a Styrofoam block is not available, and egg carton works beautifully for using as a cake pop stand while letting them set. For even more fun minion ideas, visit my All Things Minion page for additional inspiration! Hee Hee! Thanks…. hope you make some. The kids will go crazy! My littlest son saw these on my computer and has to have them! Thanks for sharing with Small Victories Sunday Linkup. Pinning to our linkup board and hope you found some great posts to visit this week! These are so cute and a perfect idea for all those moms who will be trying to put together a Minion B’day party this Fall! Thanks for joining us on Oh My Heartsie Girl Wordless Wednesday! Every Minion lover would adore these. Thanks for sharing on Creative K Kids Tasty Tuesdays, hope to see you back next week. Adorable. I know some little ones that would love this. Pinned & shared. Thanks for joining the Inspiration Spotlight party. Hope to see you again soon. Haha! These minion pops are definitely a hit wherever they go! 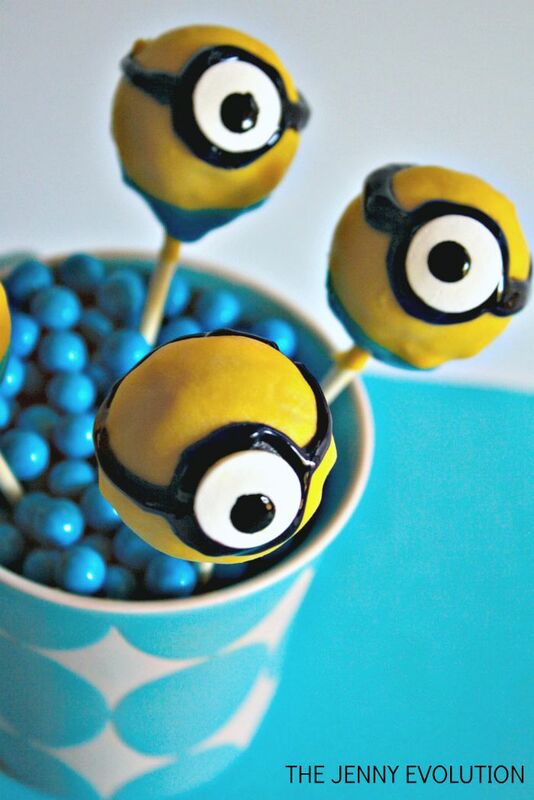 Your Minion Cake Pop’s are just adorable! Hope you have a fantastic weekend and thanks so much for sharing your awesome post with us here at Full Plate Thursday. We hope to see you again real soon. Aww, these are great. My Daughter would love them. Thanks for sharing at Creative Mondays last week. You are one of my features this week.